Fig. 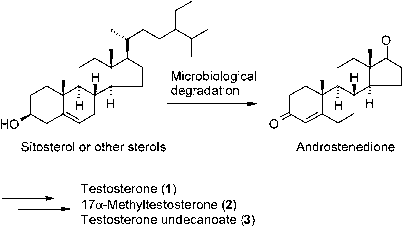 22.2 Preparation of testosterone and derivatives. A6-Nandrolone acetate Fig. 22.3 Preparation of nandrolone derivatives 4a and 4b. -15oC; 2) NH4Cl (aq). C: 1) HCl, acetone, RT; 2) KOH, MeOH, THF, H2O, RT (R' = Ac). Fig. 22.4 Preparation of nandrolone derivatives 4c and 4d. saponification (R = Ac) (Fig. 22.4) (van der Louw et al. 2003). Introduction of ethynyl by 1,6-addition is not possible. Instead, 7a-ethynylnandrolone (4e) was obtained from alcohol 9, which was produced from the A7-steroid derivative 8 by the method of KUnzer etal. (2003) (Fig. 22.5). Birch reduction of9 resulted in diene 10 which was converted by standard procedures to aldehyde 13. Wittig reaction with ClCH2PPh3Cl/t-BuONa and elimination of chlorovinyl compound 14 with n-BuLi produced ethynyl compound 15. 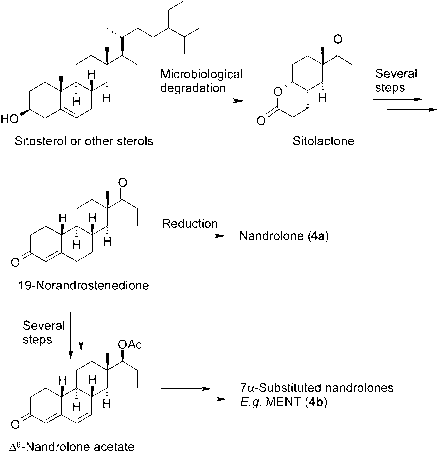 Treatment of the latter with hydrochloric acid produced nandrolone derivative 4e. Detailed information on the synthesis of 7a-ethylnandrolone (4c), 7a-vinylnandrolone (4d) and 7a-ethynylnandrolone (4e) can be found elsewhere (van der Louw et al. 2003). Also included in this study is the new 7a-alkylated nandrolone derivative Org X, the structure of which will be reported later.